Concrete is one of the most popular building materials. It is used in almost every construction project for its extreme durability and ability to withstand tons of pressure. From skyscrapers to bridges, any job that demands a product that will not fail under any circumstances needs a material like concrete. With that, this substance is definitely not one of the easiest to work with. When combined with water, the texture becomes extremely thick. Let’s face it, concrete ready-mix is not light. Instead of having to manually haul your product across the job site (which can be time consuming), use a dedicated mixing stand. These devices are outfitted with a strong-supporting platform to hold the bucket, and come with a number of features that make your job a whole lot easier. 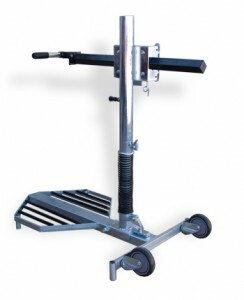 In addition to wheels, the BNMG-6100 Mixing Stand is equipped with a spring counter weight system and a multi-directional platform. The former keeps the bucket steady when the paddle mixer is used, and the latter allows you to mix the concrete from many angles (ideal for concrete that is mixed in wheelbarrows). With 1050 watts of power at your fingertips, the BNR6169 Paddle Mixer is guaranteed to turn that concrete ready mix into usable material within no time. It is factory tested to handle up to 80 lbs. of liquid material and even comes with a forward/reverse switch to prevent hang-ups. The variable speed trigger can be adjusted with ease and locked into place to ensure the concrete is mixed evenly. When a regular paddle mixer is not going to cut it (when you are working with mass quantities of material); a power mixer like the BNR600 is a must-have. This 1800 watt hand-held machine can mix everything from high-viscosity mortar to low viscosity paint, and features a powerful motor that can easily replace your ½” drill motor. It too comes with variable speeds in addition to a double insulated, 12’ power cord. If there is one mixing tool that every concrete contractor needs to have, it is this! Any tool that can reduce your project times by up to 40% is clearly worth investing in. No two mixing jobs are exactly the same. Since you are going to be working with a variety of materials, you will need to have plenty of mixing heads on hand. Though they may appear similar, the ends of the BNR001-120, BNR002-57, BNR003-120 and BNR004-120 (to mention a few) are designed to handle varying products. Some are better suited for mixing sticky and viscous substances such as plaster and adhesive mortar, while others are made for heavy and high viscosity like concrete and epoxy resin with sand. The point is you should never use one mixing head for all of your projects; not only does this increase project completion times, it also puts excess wear and tear on the device. Always choose the right accessory!